I read many blogs to get inspired, learn, and to see what other people are doing. I’ve noticed that over the past few years, more people have been writing about productivity. This makes sense because as entrepreneurs and business owners, we are always looking for ways in which we can improve our productivity – or get more done in a shorter amount of time. I often see posts and articles focusing on apps, devices, open offices, and other external technologies to help increase productivity. Such things are often helpful. For example, you can increase your productivity by not snoozing your alarm every morning. However, when we rely only on external assistance to help us solve a problem or achieve a goal, we are only partially helping ourselves. I think a lot of entrepreneurs fall into the trap of being busy and calling it being productive. Busy is really easy – productive is really hard. Busy is checking email, reading Facebook and listening to podcasts. Now, some of that may actually be productivity inducing, but real productivity is probably more like focusing on important strategic relationships, finishing that new product or completing the proposal for that new client. Fortunately, science can help us uncover productivity gains that we typically ignore. For example, psychologists and researchers have discovered that among external factors that impact our productivity, one stands out: clutter. The researchers discovered that when there was too much stuff in sight, people had a significantly and measurably more difficult time being productive. This translates into lower levels of productivity and even more clutter. Basically, clutter caused people to lose focus and brain processing power – even when they were accustomed to working in a messier area. Think about your workspace. It’s not uncommon to walk into an office and see desks with laptops, pens, paper, notepads, trinkets, glasses, coffee mugs, and more covering the top of the desk. All of those things piled up and laying around are actually causing your brain to have to work overtime during the workday when you need it to focus. 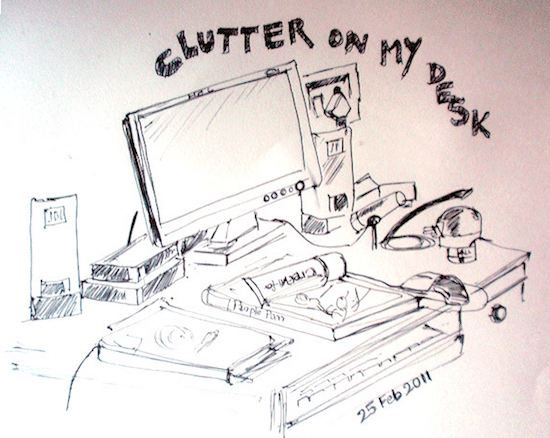 Your messy desk is disabling your ability to work at your maximum productivity. If you put it into a closet and shut the door, you are still carrying that with you. It’s important to get to the root cause of that one item and not just shove it under the rug. Saruwatari explains that mental clutter is often caused when you clear physical clutter, but don’t necessarily dealt with it. This couldn’t be more true – especially for busy business owners and entrepreneurs who find themselves multitasking with endless tasks. Sometimes putting away those notes from the meeting you still have to review doesn’t help, especially if that stays on your mind for the rest of the day until you complete the task. For this reason, Saruwatari suggests a mental dump, 1-2 times a day. This translates into creating a to do list each morning, and prioritizing it. Then, at the end of each day, a moment of reflection and reorganization of the to do list. Since it’s impossible to get everything done in one day, it’s crucial that we are able to keep everything in it’s own mental container, only opening the lid when we are ready to deal with it. You’ll get more work done when you’re dressed professionally. Why? Because you feel different. You feel more professional when you are dressed to match. I even find shoes make a difference. If I’m wearing shoes, I get more done than if I’m relaxed with my shoes off. Weird, huh? But it works. Psychology helps us to understand that we can game our own brains to be more productive. So whether it is physical or mental (or both), how you set yourself up for your day truly determines how productive you will be. By taking a few extra minutes out of our day to organize ourselves physically and mentally, we will find ourselves making up for those minutes (and more!) when we become more productive.